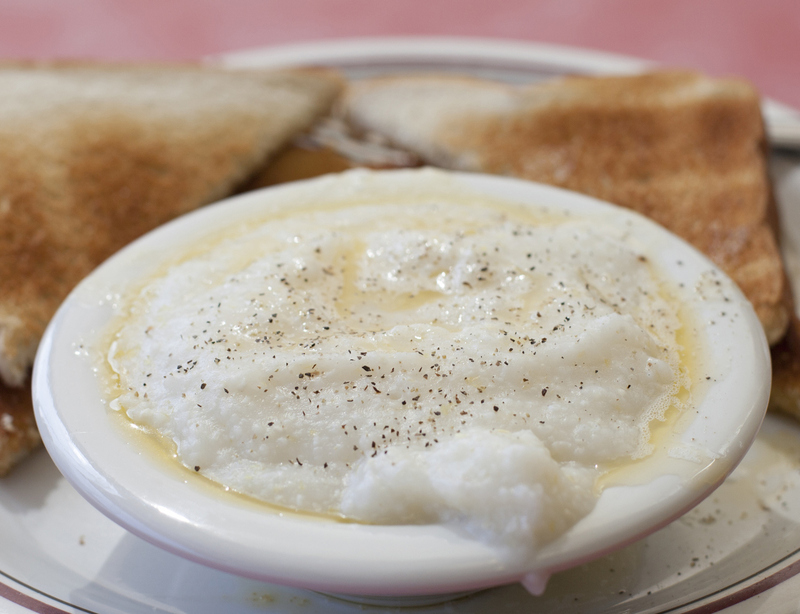 I grew up in the South and acquired a taste for grits. I generally make the “quick cooking kind.” If I can, I eat them with the traditional slice of salt-cured ham and some red-eye gravy. But mostly it’s just grits, with butter and pepper. Until a few months ago. I made some grits and they were just awful, which I attributed to the grits being stale. We bought a new box, cooked those up, and — yecch! The problem, I decided, is that not enough people in Seattle eat grits, so just about any box you buy is already too old. Way too old. Obviously, I needed to buy my grits from a store where the turnover is high: that would be in the South. I went online and discovered that the authoritative traditional grits company is McEwen & Sons in Alabama, grinding corn for many of the top chefs in the South. They essentially reinvented grits, using organic corn and going back to the stone-grinding methods of the past. They sell to the better supermarkets and sell their products online. I ordered two small, sealed bags of organic white grits. Success! Cooked for 20 minutes, they taste like — real corn grits. The rough, varied texture is delightful. I’m confident that I’m now eating grits as good or better as those you’ll get in most restaurants in the South. But — it turns I could have gone deeper in my search for serious grits. I could have gone to Anson Mills in South Carolina. Their website has a long, long read about the owner, a California entrepreneur and chef who married into a Southern family. He started Anson Mills to preserve Carolina Gold rice, an heirloom rice. The mills expanded to other grains, including corn, wheat, rye, oats, buckwheat, and farro. Their retail corn products include Antebellum Grits, Colonial Coarse Pencil Cob Grits, Native Coarse Blue Corn Grits, and Henry Moore Yellow Hominy Corn. They also sell cornmeal and polenta (including a polenta made from heirloom red trentino flint corn, long used in Italy). But ordering from Anson Mills is not a transaction; it’s a relationship. The products are shipped at -10 F and must be refrigerated or frozen when they arrive. The company has a minimum order of four 12-oz. bags of grain or one 10-lb. box. And, the website cautions, you can’t use these grains with your regular recipes; they come with their own. Well, I discovered I’m not really that much of a foodie. I just wanted my grits! And, thanks to McEwen & Sons, I’ve got them. What about ham, you ask? Perhaps you remember the year I ordered an entire uncooked salt-cured country ham, had a Seattle butcher slice half of it into biscuit slices for me, and cooked the rest (removing the rind halfway through) in maple syrup? Ah, those were the days! Have you seen the price of a salt-cured ham recently? It would be cheaper to fly to Charleston and go out for breakfast. This entry was posted in Cooking, Food and tagged Anson, Anson Mills, grits, ham, McEwan & Sons. Bookmark the permalink.